The primary treatment for a whiplash injury is to address the joint dysfunction within the spine. Your Chiropractor will use spinal adjustments and manipulation techniques to gently move the joints or vertebrae into proper alignment. The goal is to restore joint function within the spine and reduce inflammation and pain. 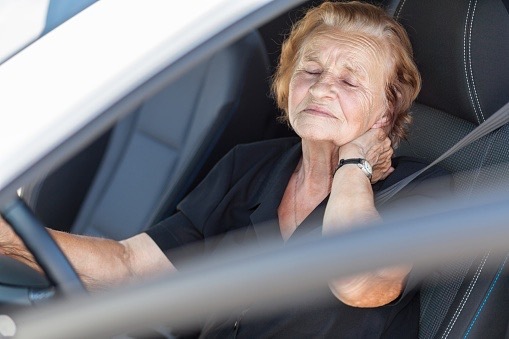 One of the most common injuries (that are not obvious after a car accident) is whiplash. Although whiplash most commonly occurs during a car accident, this injury can still occur for other reasons, such as a sudden fall or during a high-impact sport. Regardless of the reason for your whiplash injury, it's important to be seen by an experienced chiropractor sooner rather than later. Even though you can reduce your pain with medication, one of the best ways to treat the source of your pain and to ensure you're injury is recovering properly is to receive chiropractic care. Chiropractic treatment is unique to each whiplash injury, so no two patients will receive the same treatment plan. Your chiropractor will tailor their treatment to fit your particular medical needs based upon their exam findings. Before we discuss how chiropractic treatment can help you, let's first talk about what whiplash actually is. Whiplash occurs when the head and neck are suddenly and quickly forced backward and forward, putting the cervical spine through extreme stress. When this occurs, the neck muscles and ligaments are stretched beyond their normal range of motion. This can cause the soft tissues to tear or become sprained which can cause extreme pain and discomfort. For some whiplash victims, symptoms can hours or days to appear. Because of this, treatment is often pushed aside because the victim may not know right away that they have been injured. For this reason, our chiropractors always suggest an exam after someone has been involved in an accident, especially a car accident. An experienced chiropractor will be able to diagnose and treat and whiplash injury before symptoms have even manifested. Chiropractic care is an all natural treatment and alternative to pain medications. Even though the pain you may be experiencing is in your neck, there are other parts of your spine that may also be affected. Chiropractors look at the body as a whole. Instead of focusing only on your symptoms, your chiropractor will look for the underlying cause of your pain. Chiropractors will also analyze the way you sit, walk, and move in order to better understand your spine's alignment and body mechanics. During your in-depth physical exam, your chiropractor will not only focus on your neck, but they will be looking for the underlying source of your pain. Once your exam is complete, your chiropractor will provide you with a treatment plan that is tailored to your specific exam findings. The primary treatment for a whiplash injury is to address the joint dysfunction within the spine. Your Chiropractor will use spinal adjustments and manipulation techniques to gently move the joints or vertebrae into proper alignment. The goal is to restore joint function within the spine and reduce inflammation and pain. Recovering from a whiplash injury will take more than just one chiropractic adjustment. Your doctor will let you know more about the length of time they believe it will take in order for you to recover fully. It's important to attend your first appointment fully understanding that there is a high probability you'll have to return for follow up visits. That may seem tedious, but remember; you are having your injuries treated at the source of the injury. Chiropractors treat injuries, not symptoms. If you were involved in a Car Accident and are suffering from a Whiplash Injury, do not put off seeking the help of an experienced Chiropractor. At Florida Spine and Injury, we have a team of experts who have been treating accident victims for decades. Our chiropractors have the skills and training to make sure you receive the treatment you need in order to make a full recovery. Whiplash can cause very severe pain and discomfort, do not wait around hoping it will get better on its own. Whiplash is one of those injuries that can take time to manifest symptoms, but it can also become worse and worse if left untreated. Our chiropractors will make sure you receive the treatment and care that you need to recover as quickly and optimally as possible. We provide a free consultation to find out how we can best assist with your whiplash injury recovery. If you decide to move forward, we will complete our thorough exam and give you an adjustment all in the same day. Click the link below to schedule your appointment with our Florida Whiplash Chiropractors today.